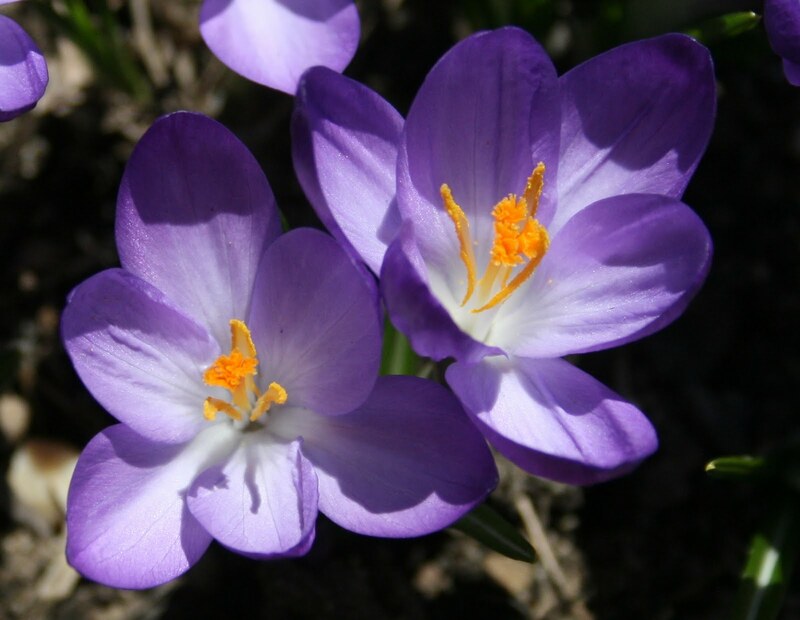 From the tops of trees to the forest floor, from woodland edges to rural roadsides, Spring is putting on a show. A spectacular show, with more richness of shapes, sizes, and diversity than the more famous Fall colors. 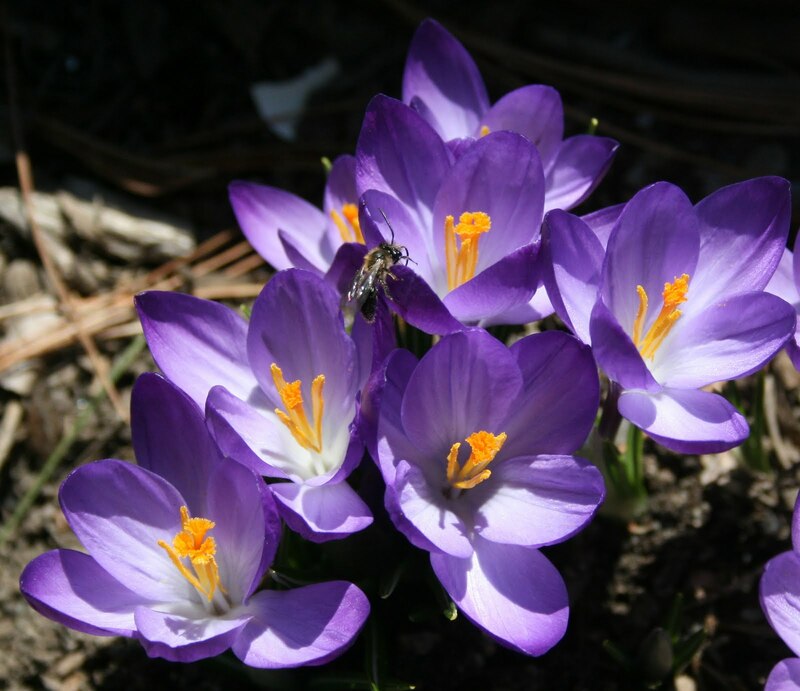 And every year is a beautiful year, except for maybe the black flies that emerged in the last few days. 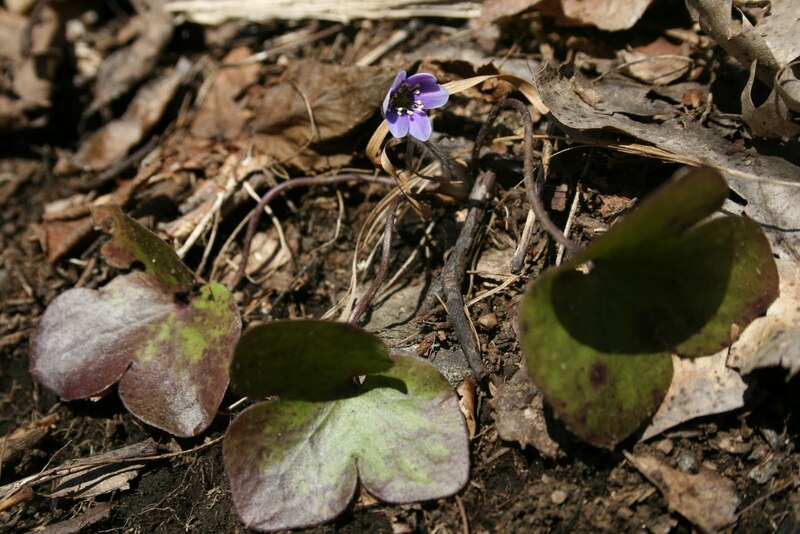 You can see the Spring colors from afar, by looking across a field at a woodland edge. 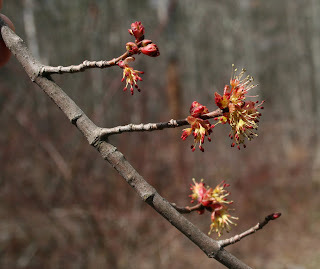 Red maples are dangling their red fruits, while sugar maples are draped in greenish-yellow dangling flowers. 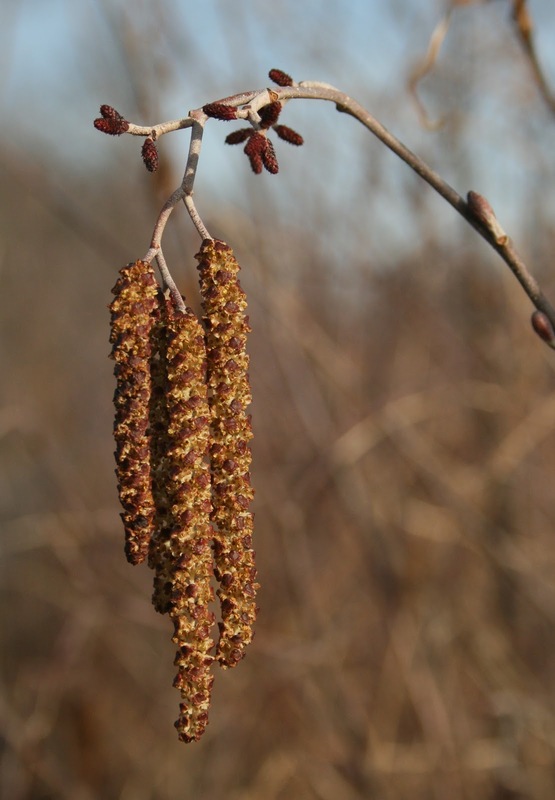 Long catkins hang from birches and leaf buds of nearly every tree and shrub are opening. the white flowers of wood anemones decorate the ground. and a little bug takes note. sit on the stem between newly emerging leaves. 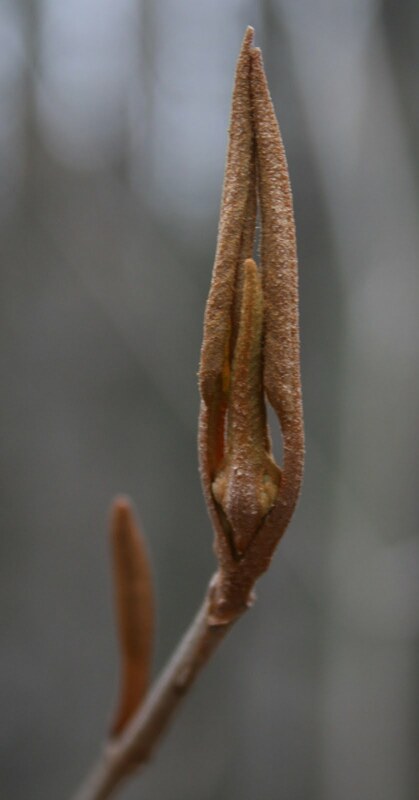 Buds of the beech tree grow longer and longer before opening. A young sugar maple leafed out without flowering. Now if only my nasty head cold would buzz off then I could also smell the Spring show. I was back in the lawn chair in the big greenhouse at New Roots Farm this morning. Conditions were entirely different from a week ago Thursday, when the wind was whipping the roof plastic and the outside temperature was chilly. Today was warm outside -- and the sun finally emerged -- and even warmer inside the greenhouse. Warm enough that we had to open both ends of the greenhouse to let air circulate through, for us and the plants. .... lots and lots of fresh, tender greens. 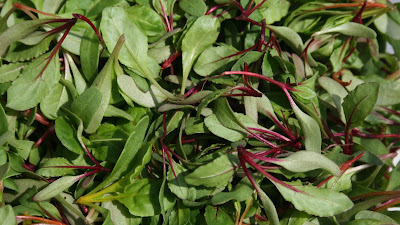 I went home with my own handiwork: a salad spinner full of mini chard and beet greens. While I sat and plucked off the extra stems in a dozen or more trays, I listened to the red-shouldered hawk scream its territorial call --- keeyuur, keeyuur, keeyuur -- from the wooded wetland below the pastures. Then a barred owl called from higher up in the woods -- Who cooks for you, who cooks for you all? The cow still bellowed from the barn, as the pastures are still too wet to turn out the animals. The animals and the farmers are frustrated with the excess rain and lack of sun. I'm hoping we've turned the page on April showers. I'm thankful for the big bag of fresh greens in our fridge, thanks to our farmer friends who have to carry all the stress of too much rain, too little sun, unknown predators eating chickens, and frustrated cows and sheep and pigs anxious for green pastures. Did I mention that April has been cloudy and rainy? Not that we've had heavy rainfalls, just regular rains and many cloudy days. I suppose it is not as bad as the Pacific Northwest where I hear that people have moss growing in their cars. I can count the number of nice, warm spring days in April on one hand. Our monthly electric bill tells us the average temperature for the month and for the same month a year ago. The average temperature in April 2010 was 50 degrees. This April the average temperature was 44 degrees. We're burning through more oil to heat the house. These are the times we wish we had a wood stove, especially since we've been thinning our woods to allow the bigger oaks and maples more room to grow. Instead, the felled trees are going to our neighbor for their wood stove. In a previous post I mentioned planting arugula, which sprouted in 12 days. Each day I check its progress. It's like watching a pot boil as it refuses to grow. The arugula is just waiting for the sun to come out. I planted cilantro at the same time and it finally sprouted on Sunday, taking three weeks to germinate. The spinach was a little quicker to germinate and now all three plantings -- the arugula, cilantro, and spinach - are at the same stage, about a thumbnail high. The good news, the sugar snap peas planted on April 16th just sprouted.The bad news is that rain continues this week, making it difficult to plant more crops. Seed potatoes, carrots, and more greens await a dry day. I transplanted tomatoes today while sitting in a lawn chair wearing a t-shirt inside the greenhouse at New Roots Farm. The sun moved in and out of the clouds and the wind rattled the plastic roof of the greenhouse. It felt good to be handling tiny seedlings of Green Zebra, Orange Blossom, Peach, Juliet, and Sweet Olive tomatoes and to be out of the wind. Trays of basil, peppers, and other tender seedlings lined the tables around me, waiting for warmer days. When I stepped outside, the cold wind whisked away the warmth immediately and I pulled on an overshirt. Winter seemed long and cold. Spring so far is cool. I can think of only one or two days above 70 degrees this year. We relish the days when the temperature reaches the mid-50s and the sun is out. The arugula that I direct seeded in my home garden sprouted within a week, but since has remained fixed in height, just waiting for a tad more warmth. 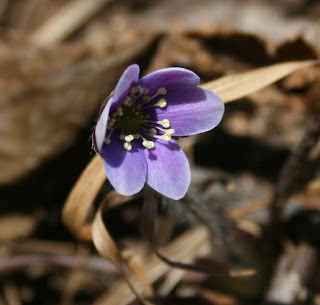 Still, you can find signs of spring moving along at a normal pace. Clusters of fragrant flowers hang from the branches of the common red maple tree. From a distance a stand of red maples provides a red hue to the woodland edge. 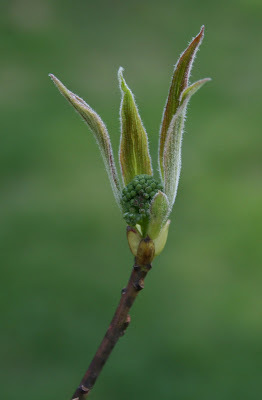 The lilacs are blooming, or at least the flower buds are opening and you can see a hint of purple. Down by the river's edge the false hellebore is unfurling. 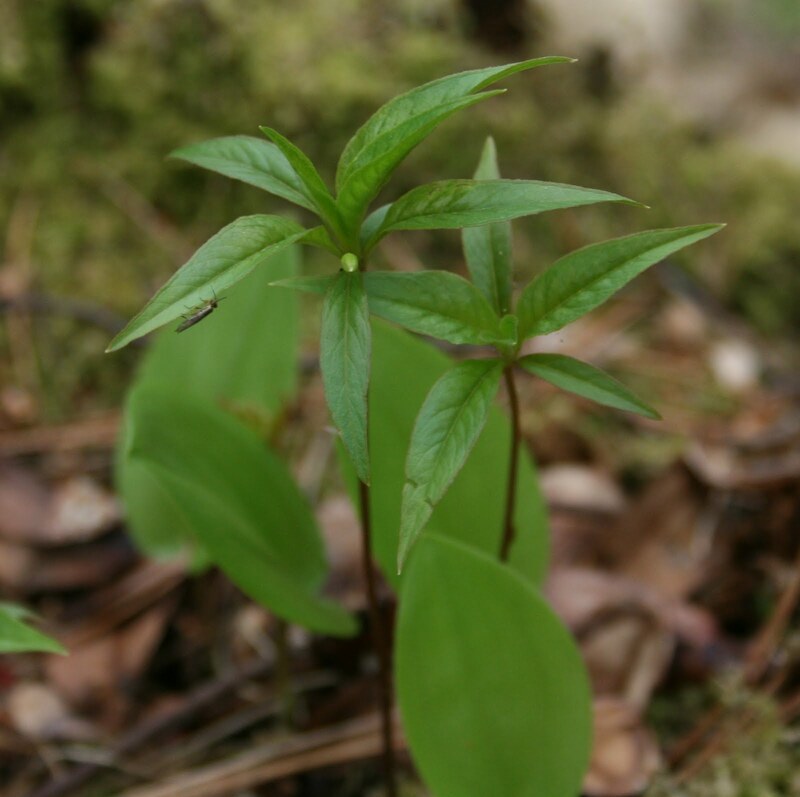 Its bright green, heavily ribbed leaves are pretty as any flower. Along a wet, wooded trail, the cinnamon-colored bud of a witherod clasps the still emerging flower like a pair of praying hands. More than an inch of rain fell Saturday night. Fortunately the fierce storms that hit the Carolinas brought only modest rain and no severe winds or funnel clouds. Sunday morning was bright and beautiful here. Kodi and I walked a favorite trail at College Woods in Durham. Small streams ran high with the overnight rain and the Oyster River was high, fast, and silty. In some places water flowed over the trail, much to Kodi's delight. One such spot was covered in an amorphous black blob. 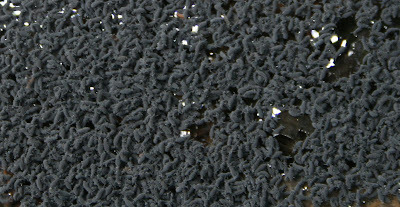 A closer look showed a writhing mass of springtails. And you had to look close to notice, as these tiny insect-like creatures are just a couple millimeters long. Springtails live in the leaf litter of moist soils, feeding on decaying vegetation. By some counts there may be 50,000 to 100,000 springtails per cubic foot of soil. 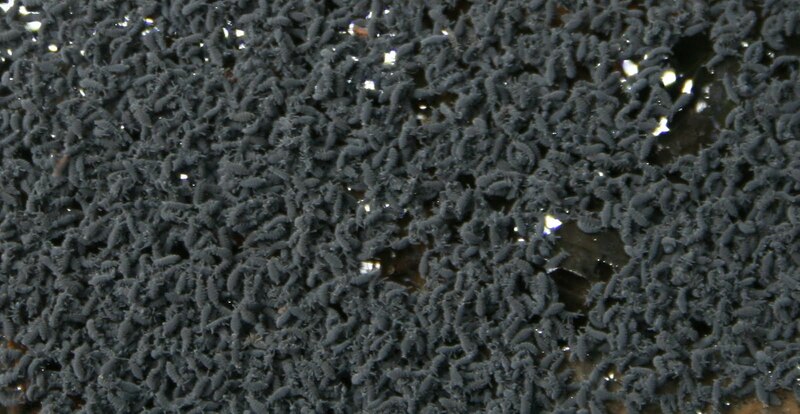 The mass of springtails washed into a huge mass after the weekend rain surely numbered in the tens of thousands. Typically I see springtails on a warm, late winter/early spring day when they emerge onto the white snow. This, along with their "hopping" behavior, led people to call them "snow fleas." The other occasion to see springtails is after a big rain, as on Sunday. Perhaps this is the main dispersal mechanism, as this population of springtails was washed into a new area, much farther from where they started. Snow fleas have a furcula - an odd little appendage tucked under their abdomen. When released it lets them spring a few inches from where they started. An anti-freeze protein allows them to stay active in winter, when most insects would perish from the cold. Springtails are a type of hexapod, a predecessor of insects that date back to dinosaur days. An amazing little creature. It was a busy week here. I was away for two days for work-related meetings in Maine. While I was away Kodi was diagnosed with Giardia. He had diarrhea and given his fondness for water we were fairly certain of the problem. He's been on five days of treatment -- metronidazole and panacur -- and has mostly recovered, although he could easily become infected again by the little protozoan that attaches to the wall of the small intestine. All of our favorite haunts have pools, wetlands, and sluggish streams, which are prime sources of Giardia. 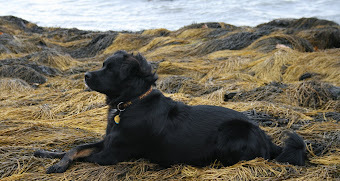 Beaver are considered a major carrier of Giardia as well as feces of other dogs with Giardia. It is nearly impossible for us to avoid water, beaver, and other dogs. So, Kodi will likely have occasional bouts of Giardia, which does not slow him down in the least. In bird news, the week started with the first mini migration of warblers. While walking a floodplain forest with a colleague, we spotted a small flock of palm, pine, and yellow-rumped warblers foraging for insects in red maple canopies. Later in the week I saw my first hermit thrush of the year. This is the earliest migrant of the "spotted thrushes," and is easily recognized by its reddish tail that it flicks up and slowly lowers. Chipping sparrows returned to our neighborhood. Their long, steady trill, bright rufous cap, and plain gray breast are best keys for this common sparrow that likes to hang out in shrubs and trees along our roadsides. While working in the yard this weekend, a first of the year blue-headed (formerly solitary) vireo sang from the pines across the road. Its slow, clear notes -- see you, here I am, see you -- brighten anyone's day. Speaking of the yard and gardens. We worked hard for two days while the weather was nice. A new pea fence was built and the sugar snap peas planted just before last night's heavy rain and wind. We built one more raised bed of rough hemlock from a local lumberyard. I re-designed my herb garden, with one goal to put the spearmint into a large, buried flower pot to contain its wayward ways. 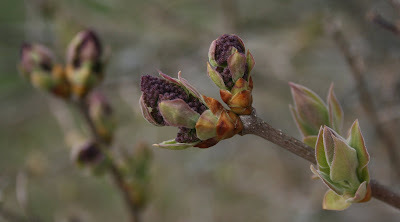 Leaf buds of many shrubs and small trees have opened and spring colors (which nearly rival fall colors) are beginning to emerge. I arrived back home mid-day Saturday, after a few days away. I always walk around the yard after being away to see what's been happening. 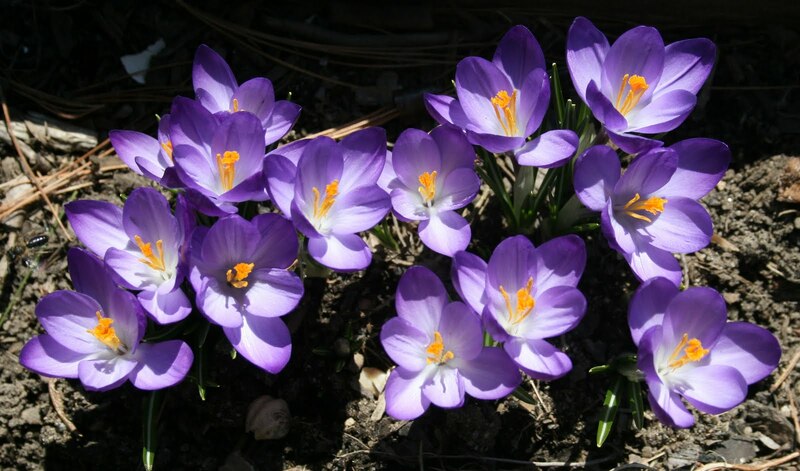 The crocuses were in full glory. On a Saturday afternoon walk on one of our favorite town trails, we spotted the first garter snake of the year sunning itself alongside the trail. The snake was a little perturbed that we'd disturbed its sunbathing. 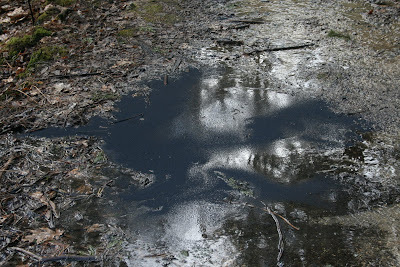 And the wood frogs were quacking from a vernal pool. A sound that I've been waiting to hear for weeks now. On the way back to the car, a mourning cloak (butterfly) flitted by in the understory. On Sunday we almost started to complain that it was too hot, too soon. Bu then the temperature moderated and it rained during the night. This is good for the cilantro, arugula, and spinach that I planted. I now excitedly await their germination. Buds are bursting open during these (finally) warm, sunny days of Spring. The 45 turtles that I saw sunning themselves a few days ago is telling too. Soon, we'll be complaining that it is too hot, but not yet. I'm heading back home today and already thinking about planting the sugar snap peas. During the turtle walk the other day, I noticed the alder and willow buds were looking particularly lush in the spring sunshine. Yesterday I hear or saw several new spring bird arrivals on the rail trail walk: a male belted kingfisher chattered at us with his crest raised, a kestrel perched silently atop a slender snag, several yellow-shafted flickers called, and a meadowlark sang from a nearby field. A superb day for any outdoor activity, whether work or play. I took part in a bit of both. By the end of the day here at Winterberry Farm, the perennial beds were raked, the leaves and branches picked up, and the rhubarb patch was weeded. In between these projects, Kodi and I hiked up to Rattlesnake Knob, a small outcrop with a nice view over to Long Mountain. This is where I learned to love nature as a kid. 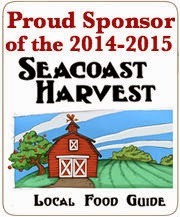 This trail is just a mile from Winterberry Farm, the family homestead. It winds through a beautiful hardwood forest of oak and hickory and beech. In early spring, before leaf-out, you can see through to the forest floor from a nice perch on Rattlesnake Knob. A small, clear brook runs alongside a portion of the trail that leads to Rattlesnake Knob. 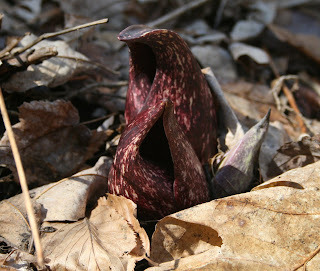 Skunk cabbage were emerging in the moist soils along the water's edge. This plant, which seems to have few admirers because of its skunky smell, is a favorite spring sighting of mine. It is quite beautiful, despite its odor, which is only noticeable if the plant is crushed. Most of the trail follows a gentle grade before it turns sharply right and climbs steeply up the side of Rattlesnake Knob. The steeper section requires an occasional pause to catch one's breathe. Or you can make an excuse to stop and look at woodland wildflowers, and there is a beauty peeking out of the leaf litter this time of year: round-lobed hepatica. Later in the day, my parents, Kodi, and I went for another walk. This one along a rail trail that passes by a large wetland. Beaver are active in this wetland and turtles too. Not only did I see my first painted turtle of the year sunning itself, I counted 45 turtles lying about on logs and hummocks in about a 1/4 mile stretch of wetland! 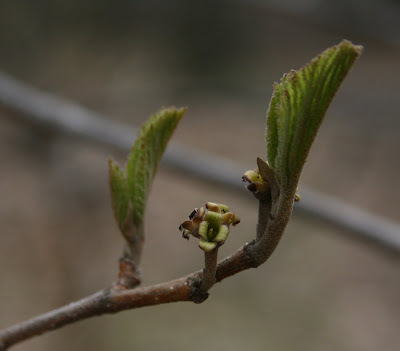 I wrote a few days ago that the pace of spring emergence is quickening. Today was one of the those days, where something new appeared no matter where I looked or listened. A chorus of spring peepers fills the evening air as Kodi and I step outside for a final walk about the yard before calling it a night. Tomorrow will surely bring something new, but we might just go back to see the turtles too. I'm at Winterberry Farm in western Massachusetts for a few days, helping my parents with yard clean-up and raking winter chaff from the perennial beds, and other odds and ends. With help from Mom last fall, we planted five rows of garlic in the west garden. We sprinkled several bales of straw over the bed for winter cover and to curb weeds during the growing season. I checked on the garlic when I arrived today. The shoots are up 4 to 5 inches or more. It feels good to see the green growth after a long winter. I returned from New Roots Farm around 4:30 this afternoon, after my weekly visit to help start seedlings (today it was a dozen trays of rainbow Swiss chard and a couple trays of cilantro), and almost immediately sat down at my computer to catch up on the news of the day. Out of the corner of my eye I thought I saw Kodi coming around the corner of the house. But he was nearby inside the house. So, instead of Kodi, it was a large porcupine waddling into view! The view from my window keeps on giving. Last week I spent 5 hours watching a woodcock probe for earthworms in the small patch of woods outside my window. I've watched hawks take songbirds and seen pileated woodpeckers dramatically swoop onto the trunk of the big pine. About once a year I see a fox trot by. A barred owl visited last fall. Just this week I've seen spring migrants arrive -- a phoebe a few days ago and a pine warbler today. 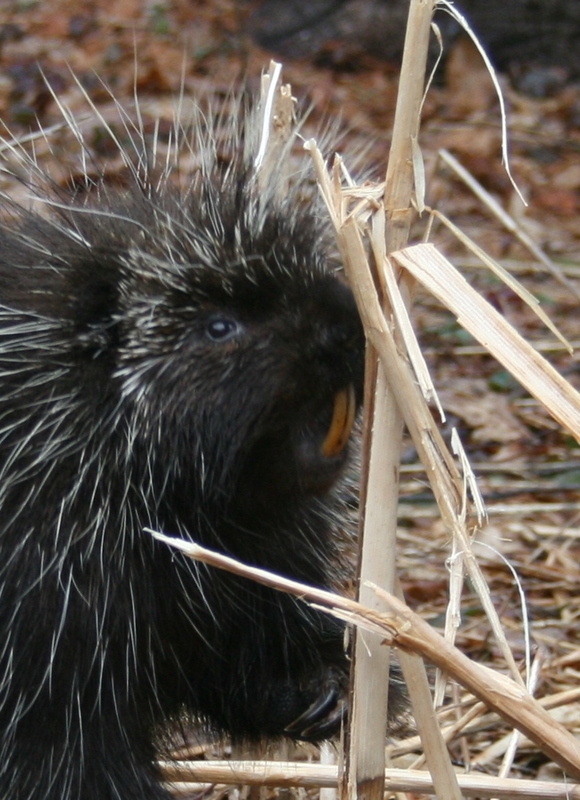 This porcupine, though, was a treat. 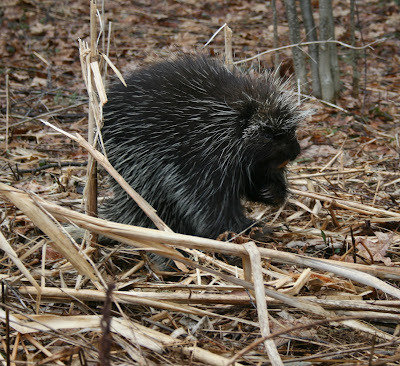 Here he (or she) is, checking out last year's cattails. 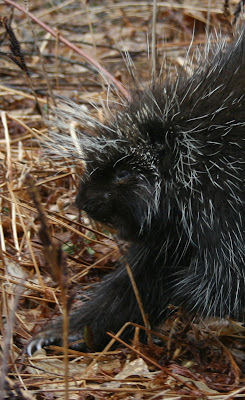 Mostly I see porcupine or signs of porcupines in winter when they spend their time feeding on hemlock bark and boughs. 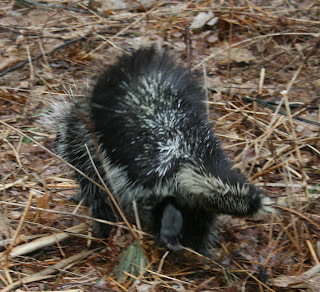 Their dens are obvious as their latrine is at their den entrance -- usually in a rock crevice or root of a fallen tree. 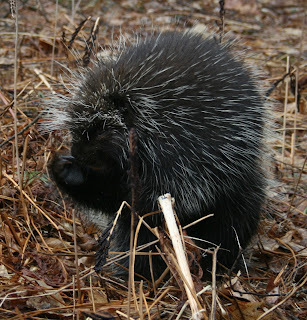 I rarely see them wandering about during the day, as porcupines are primarily nocturnal. 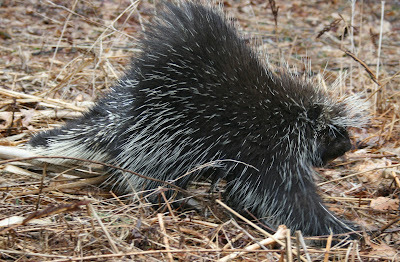 Today though was overcast and it was late afternoon, so I suppose it was almost suppertime for the porcupine. Porcupines are near-sighted, but have a good sense of smell and hearing. I went outside to get better photos of this one and got within four feet before it turned away from me. There was no danger from the quills as porcupine move slowly and quills only come out if you come in contact with the porcupine. Porcupines do not "throw" quills. That is good because they have upwards of 30,000 quills. 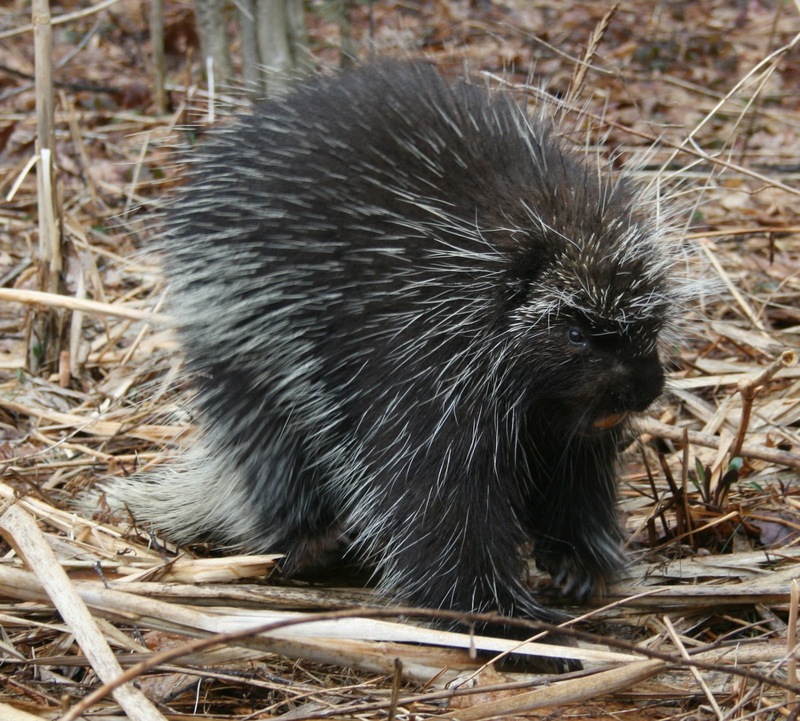 And a good thing that I left Kodi inside; he has yet to meet a porcupine. 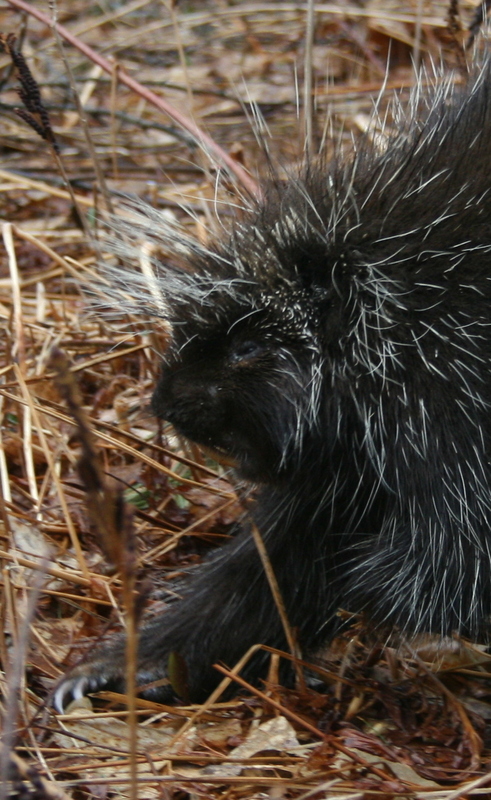 I got a nice look at the porcupine's foot pad as he headed over to our neighbor's yard. 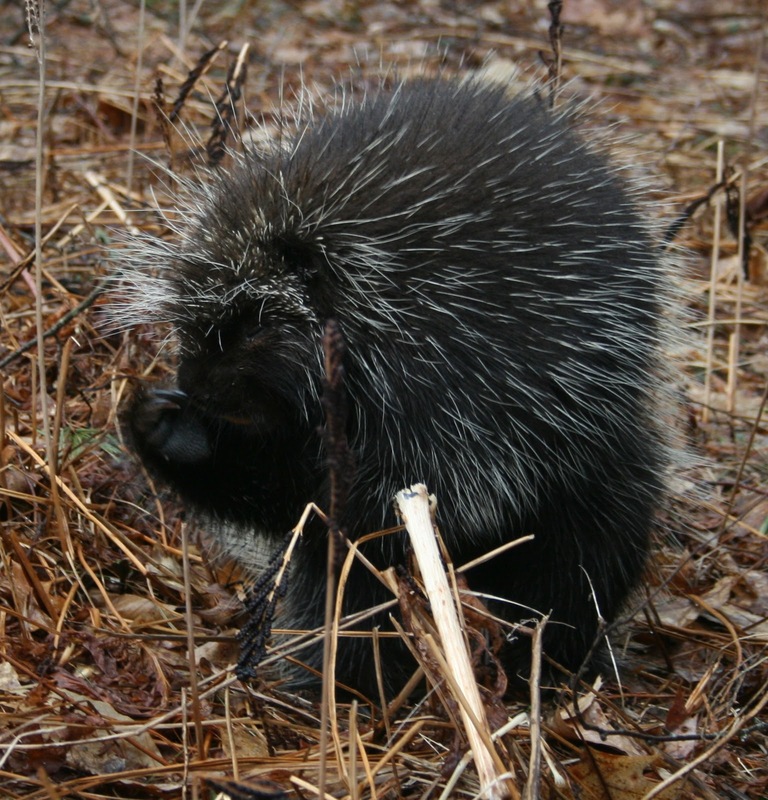 I hope they enjoy the porcupine visit as much as I did. The first warm rain fell last night; fog and light rain continued into the day. Spring seems late. I still have yet to hear wood frogs calling from woodland pools -- maybe they moved in the rain last night. Today I heard a few spring peepers as Kodi and I walked the wetland edge behind our house at mid-day. Yesterday I watched an osprey circle over the wetland. As I sit at my office window writing this post, another spring sighting greets me. A pine warbler -- a new spring arrival -- just appeared at the feeder. I just heard him sing his soft trill. Nice. On my wanderings along the wetland, I watched a pair of hooded mergansers cruise among the buttonbush. A pair of Canada geese has taken up residence on the beaver lodge; the female is already sitting on a nest on the side of the lodge. The male lingered nearby, keeping a watchful eye and emitting honks if he sensed danger. We slipped away so as not to disturb the female. Fresh beaver chews littered the water's edge and fish scales left between hummocks of sedges is a sign of an otter meal. In the adjacent woods, beneath hemlocks and pines and red maples, I lifted a small rotting log. 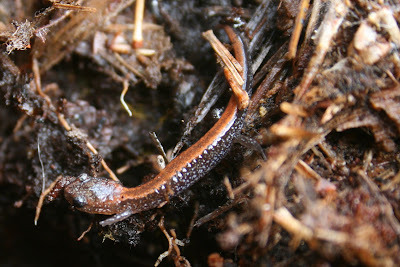 There rested a red-backed salamander. This is our most common salamander. It breathes through its skin and spends its entire life in moist uplands. The female lays a small grape-like cluster of eggs in a crevice under a rotting log or tree stump. Spring may be a little late, but the tempo is picking up. 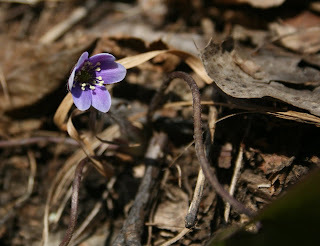 I sense the rush of spring bird migration, frog and salamander movements and mating, and the emergence of early woodland wildflowers is at hand. This makes me chuckle (and sigh) thinking that some people rush off to the store to check out the newest spring clothing fashions. Just think what they are missing. I'd rather be at the water's edge. So began the readings from A Sand County Almanac on Saturday at the first New Hampshire Aldo Leopold Weekend in Northwood. More than forty people gathered to hear University of New Hampshire ecology professor Dr. Tom Lee talk about Aldo Leopold and his legacy. Following Tom's presentation, a half dozen people read essays from A Sand County Almanac - each had picked their favorite passage. Steve began with the Foreword to the book, which begins with the passage above and ends with, "Perhaps such a shift of values can be achieved by reappraising things unnatural, tame, and confined in terms of things natural, wild, and free." Another Steve and his 8-year old daughter Brenna read together a section about pines from the chapter December; the pine being Brenna's favorite tree. Harmony read January Thaw, then Richard read, On a Monument to the Pigeon - a story about the extinct passenger pigeon, a species once numbering in the millions. Rebecca read Thinking Like a Mountain, the recounting of Leopold's transformational experience watching a fierce green fire dying in the eyes of a mother wolf that he had shot. I read Sky Dance, in celebration of the mating ritual of the male woodcock that can be seen and heard outside each evening in spring. A potluck supper followed the readings. People shared food and conversation, renewing a community tradition that has lost its way in recent times, but which is being revived in Northwood. More readings from A Sand County Almanac followed; people are inspired to read passages from Leopold's writings, so timeless is his thinking. The evening culminated in the screening of the documentary film, Green Fire - Aldo Leopold and A Land Ethic For Our Time, a New England premiere. Nearly 100 people gathered to see the movie and dozens stayed on to talk about Leopold's legacy and the need for a renewed land ethic in our time. Leopold wrote, "A land ethic, then, reflects the existence of an ecological conscience, and this in turn reflects a conviction of individual responsibility for the health of the land. Health is the capacity of the land for self-renewal. Conservation is our effort to understand and preserve this capacity." 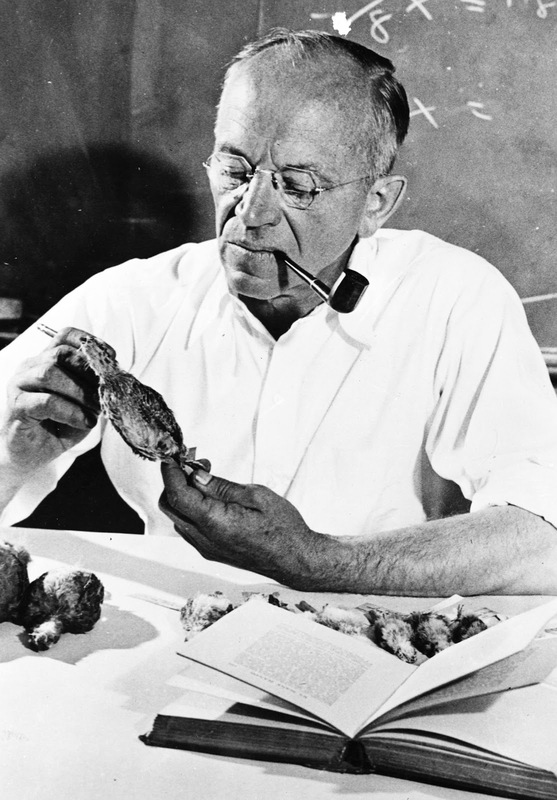 Leopold was not much interested in politics, he cared about people and the land and worked to improve the relationships of people to the land. He must have had a positive outlook, given the events of his time (1887-1948). The issues are no less daunting today. With Leopold as a guiding light, we should look not to ethically-challenged politicians for a land ethic, but to each other. Together we can build a community with an ecological conscience. In Leopold's words, "All ethics so far evolved rest upon a single premise: that the individual is a member of a community of interdependent parts."